Company director Timothy Hill, 67, fitted a laser jammer to his Range Rover and then gave police the finger as he drove past police safety cameras. On three separate occasions in December 2017, Hill drove past mobile safety camera vans on the A19 near Easingwold, Thirsk and Crathorne in North Yorkshire. On all three occasions he was photographed gesturing at the camera with his middle finger, police also detected a laser jammer on his Range Rover. When police tracked him down he lied about the location of his car and attempted to dispose of the laser jammer when he discovered he was being investigated. Although police were unable to ascertain his speed he was charged with perverting the course of justice and plead guilty at court. Yesterday at Teeside Crown Court he was convicted of perverting the course of justice and jailed for eight months. Hill was also banned from driving for a year. The judge who jailed Hill said such actions "strike at the heart" of the justice system and his sentence must act as a deterrent to others. 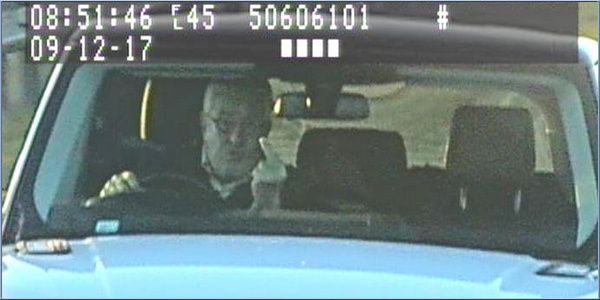 Traffic Constable Andrew Forth, who led the investigation for North Yorkshire Police, said afterwards, "If you want to attract our attention, repeatedly gesturing at police camera vans with your middle finger while you�re driving a distinctive car fitted with a laser jammer is an excellent way to do it." I�ve tried gardening, yoga, meditation and medication and yet I still want to slap someone sometimes..
Visit my MoHo forum, motorhomeowners.org free. This is a travesty of justice. Prison for a pensioner with an eight month revenge conviction to deter others? How many pensioners are fitting jammers that we need to imprison pensioners? Mean time crimes go un-investigated due to lack of resources. Shame on you all. Come on, the idiot was begging to be nicked and he was granted his wish, what if he'd caused a collision or killed someone due to his inattention to where he was going, the man was a pratt and got what he deserved. I'm 67, if I did the same I'd think fair enough. Why is it important that he's a pensioner? If he had been given a non custodial sentence, do you imagine that non-pensioners would have assumed that this was solely because of he is in receipt of a pension and that they, in contrast, would be in the slammer? This bloke sounds like exactly the sort of ill mannered, arrogant lout who should be banged up at Her Majesty's (and almost everyone else's) pleasure. You'd save a lot of typing effort if instead of "safety camera vans" or the more accurate "speed camera vans" you just called them "scamvans"
That way he will pay , not the public. Nah way too sensible, but I'd vote for that, actually all 4 options. I'd vote for that too - and my vote counts, because I've been a pensioner since before most of you were born!